"Maybe they all ran away to join the circus." Hellboy has been called many things throughout his career (both good and bad). And he's done good things and bad things en route to being named accordingly, but you'd be hard-pressed to think he's doing anything bad in Hellboy and the B.P.R.D. : 1953 - Beyond the Fences #1 from Dark Horse Comics. The issue is written by Mike Mignola and Chris Roberson, penciled by Paolo Rivera, inked by Joe Rivera and colored Dave Stewart. A mysterious creature hunts the children of an idyllic suburban town and the BPRD get more than they bargained for when their investigation begins to seem strangely familiar. Hellboy and the B.P.R.D. : 1953 - Beyond the Fences #1 plays out much like many other tales in the Hellboy universe, in that Hellboy and the B.P.R.D. are tasked with investigating a mysterious entity terrorizing an otherwise idyllic town. Mignola and Roberson certainly doesn't stray too far from this formula, but in Hellboy and the B.P.R.D. : 1953 - Beyond the Fences #1 the story feels a bit more intimate. Hellboy is characterized as somewhat well-known, yet Mignola and Roberson don't present him as so much a rock star. Because the characters are fairly well-known, the writing duo can spend more time focusing on the story itself which is pretty interesting. The pacing is very methodical and slowly works up to a reveal at the end that sets the tone for the duration of the series. Hellboy's very distinctive look is handled well by Rivera, rendering him as a somewhat scrawnier version of himself. 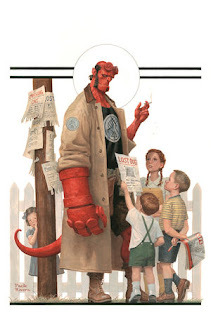 His smaller size makes him seem more vulnerable, even if fans of the series know that Hellboy is more than capable of destroying the world if he really wanted to. Other characters are illustrated with a 1950s sensibility that's befitting of the series' title. Panels are laid out pretty cleanly and accented by empty gutters, all of which adds a scrapbook feel to Hellboy and the B.P.R.D. : 1953 - Beyond the Fences #1. Rivera's inks are subtle yet effective, while Stewart's colors evoke a strong sense of familiarity with the property. Hellboy and the B.P.R.D. : 1953 - Beyond the Fences #1 is another solid entry in the Hellboy universe. It focuses on Hellboy at a younger point in his life, before he's gotten a chance to make more of a name for himself. Mignola and Roberson have crafted an issue that's very seamless and easy to read, giving a pretty monstrous twist at the end. Rivera's pencils are very clean and simple, effectively capturing the atmosphere of the era. Hellboy and the B.P.R.D. : 1953 - Beyond the Fences #1 will appeal to fans of the property as well as those looking for an interesting book about chasing monsters. Hellboy and the B.P.R.D. : 1953 - Beyond the Fences #1 is in stores now.